A ramekin is a small glazed ceramic or glass serving bowl used for the preparation and serving of various food dishes. 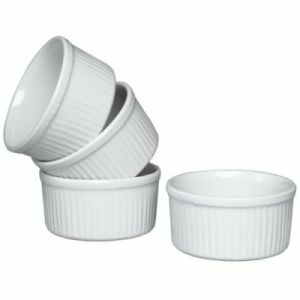 Ramekins are commonly used for serving a variety of dishes such as crème brûlée, French onion soup, molten chocolate cake, moin moin, cheese or egg dishes, poi, potted shrimps, ice cream, soufflé, baked cocottes, crumbles, or scallops, or used to serve side garnishes and condiments alongside an entrée. They also can be used for appetizers such as mixed olives. Traditionally circular with a fluted exterior, ramekins can also be found in novelty shapes, such as flowers, hearts or stars. Ramekins are often built to withstand high temperatures, as they are frequently used in ovens, or in the case of crème brûlée, exposed to the flame of a cooking torch.